In Mikkey Dee's Evans setup site site comes the information on this drumhead. During [this interview](http://www.moderndrummer.com/site/2014/05/ben-thatcher-royal-blood-drummer-blog/#.VMTRr5n6lGp) with Modern Drummer, Ben is quoted to say: "Drumheads can make or break your drum sound. 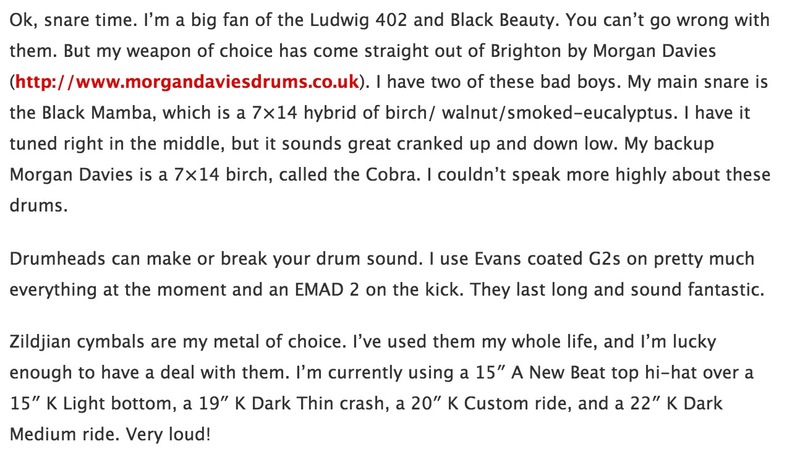 I use Evans coated G2s on pretty much everything at the moment and an EMAD 2 on the kick. They last long and sound fantastic"
In the October 2016 DRUM! magazine, Jen's set is broken down and her equipment is listed. These great companies are supporting me, check them out! This is the best bass head I've got. I tried lots of models before and none gave me such a good and tight sound. Best bass drum head ever!